The Senate this week has an opportunity to check one of EPA’s worst regulations: the Mercury and Air Toxics Standards Rule, also known as the Utility MACT. On Wednesday, the upper chamber of Congress will vote on S. J. Res. 37, a Congressional Review Act resolution of disapproval that would effectively block the Utility MACT. To read more about the merits of S. J. Res. 37, click here and here. Suffice it to say for this post, EPA’s Utility MACT would cost $10 billion annually, making it one of the most expensive regulations ever. It would also ban the construction of new coal-fired power plants. As against these compliance costs, the Utility MACT’s purpose is to protect a supposed population of subsistence fisherwomen, who consume 225 of pounds of self-caught fish, from exclusively the 90th percentile most polluted bodies of water, during their pregnancies. I sincerely doubt that these women exist. My doubts are exacerbated by EPA’s failure to identify a single member of this putative population. Instead, they are modeled to exist. For Members of the Senate—but especially among Members of the Minority Party—a “yes” on S. J. Res. 37 should be a no-brainer. 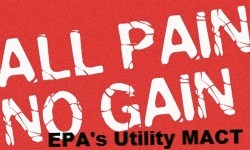 After all, the Utility MACT is all pain and no gain. Inexplicably, however, Sen. Lamar Alexander (R-Tenn.) has steadfastly opposed the bill. I say “inexplicably” because Sen. Alexander’s rationale for opposing S. J. Res. 37 makes no sense. Simply put, this is nonsensical. For starters, Tennessee’s air shed is already protected from upwind pollution by the “Good Neighbor” provision of the Clean Air Act. As its name would suggest, this provision requires that upwind States mitigate any pollution that adversely affects air quality in downwind States. Pursuant to the Good Neighbor provision, EPA last summer promulgated the Cross-State Air Pollution Rule, the purpose of which is to “stop dirty air from blowing into Tennessee” (to borrow Sen. Alexander’s terminology). Given that both the statute and code of federal regulations already protect Tennessee from upwind pollution, Sen. Alexander’s justification for supporting the Utility MACT is basically a call for duplicative regulation. Sen. Alexander’s anti-S. J. Res. 37 reasoning is rendered even sillier by the fact that Tennessee is not currently victimized by out of state air pollution. If you follow this link to EPA’s website on the Cross-State Air Pollution Rule, there’s an interactive map that demonstrates all the “linkages” between upwind pollution and downwind areas whose ambient air quality is in violation of Clean Air Act standards. If you slide your mouse over Tennessee, it becomes evident that there are no upwind-downwind linkages adversely affecting Tennessee. Rather, the arrows are all pointing outside of the State, meaning that it is Tennessee about which neighboring States should worry. In light of the fact that Sen. Alexander’s avowed justification for opposing S. J. Res. 37 is wrong, I remain perplexed as to why he seems to be doing everything in his power to protect the Utility MACT. It is interesting that out of the ~$90 billion of (supposed) annual benefits under the Utility MACT, roughly $71 billion (80%) is estimated for states also targeted by CSAPR!!!! All of these benefits are due to PM2.5 reductions, of course, since EPA can’t seem to accurately figure the benefits of mercury reductions (the main reason for the Utility MACT). Next post: Air Quality in America – You Can Find It Here!